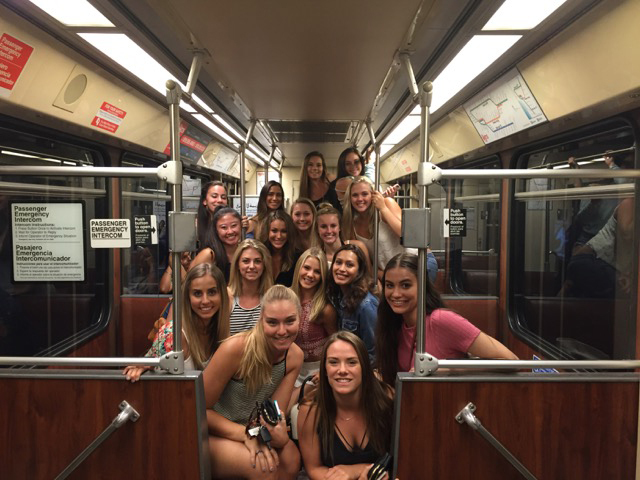 The SDSU Dance Team began in the fall of 1998. Since then, the team has grown and is nationally ranked within the competitive collegiate dance community. 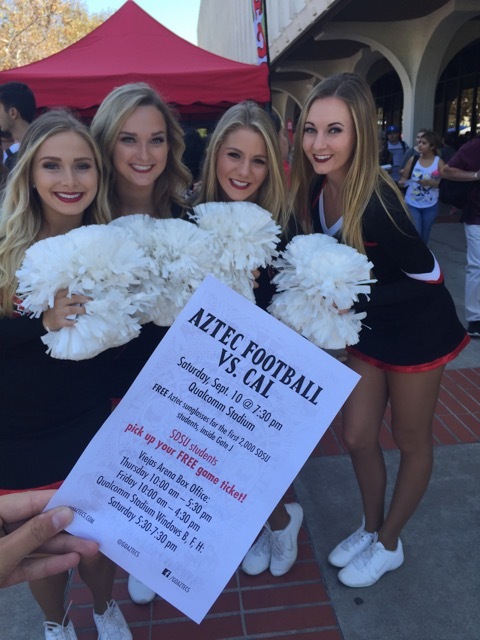 The SDSU Dance Team is dedicated to representing the University in an energetic and positive manner while entertaining Aztec fans at all home football and basketball games as well as numerous campus, charity and corporate events city-wide. 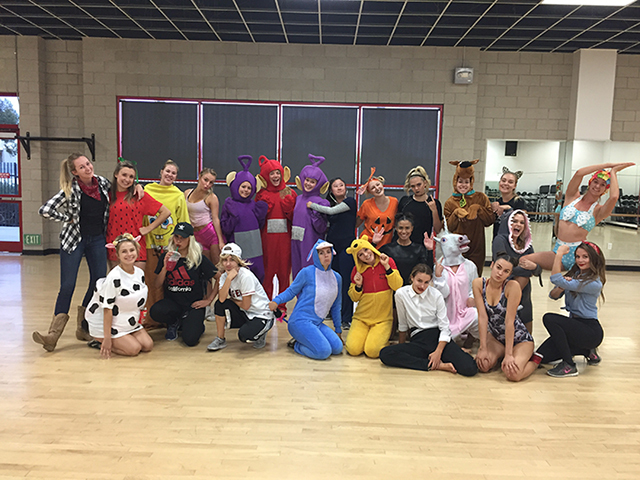 The team allows students with technical training to continue their passion for dance and contribute to the school spirit while pursuing their academic goals. 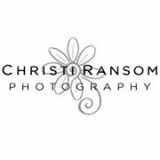 Many of the graduates of this team have gone on to dance professionally. 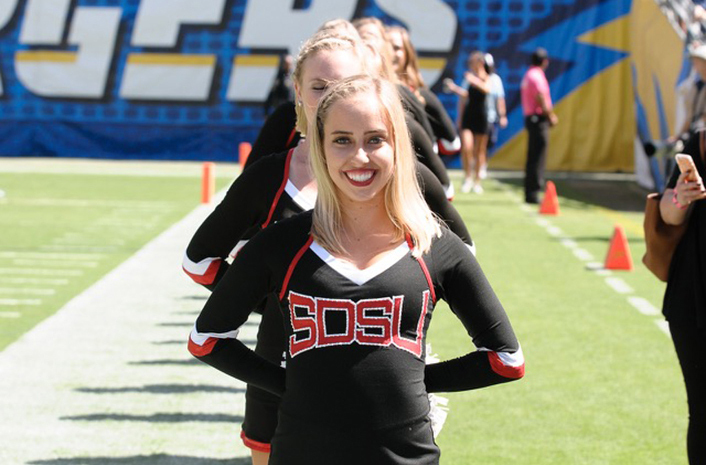 The SDSU Dance Team looks forward to another promising year of entertaining its fans! 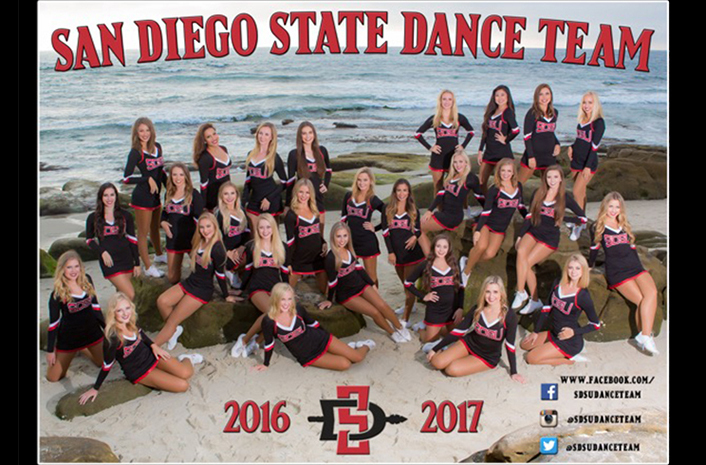 MEET THE 2016 - 2017 SDSU DANCE TEAM! Nicole is 18 years old from Carlsbad, California. She is a Freshman at San Diego State this year. Although Nicole is majoring in dance right now, she plans on majoring in Kinesiology in the future. Nicole has been dancing since she was two years old and is very excited to continue her love for dance in college. Her favorite styles of dance are hip-hop and jazz. Nicole is most looking forward to creating friendships with her team and UDA nationals. Claudia is 18 years old from San Marcos, California. 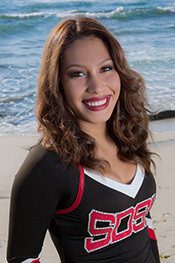 Claudia is an incoming freshman to San Diego State University and is majoring in dance. She has been dancing for 12 years and her favorite styles include tap, jazz, and contemporary. This is her first year on the team and is really looking forward to preforming at all the events and creating new friendships with her teammates. Bailie is 18 years old from San Marcos, California. 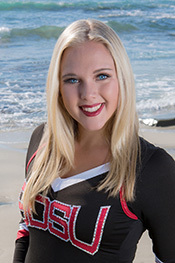 Bailie is a freshman at San Diego State University and is majoring in Journalism and Media Studies. 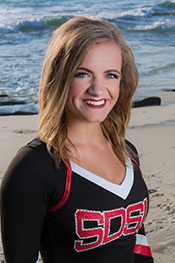 She has been dancing for 14 years and this is her first year on the SDSU dance team. She is looking forward to experiencing football games, basketball games, and getting to know her teammates! Rachel is 18 and from San Diego, CA! 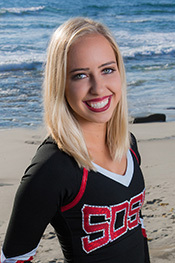 She is super excited for her first year at SDSU and is thrilled to be a freshman on SDSU’s prestigious Dance Team. She has been dancing for 15 years and her favorite styles are contemporary and jazz. She is most looking forward to dancing at football games and traveling to Florida for UDA Nationals! She is a Liberal Studies major and after college she hopes to be an elementary school teacher. Kristi is 18 years old from Omaha, Nebraska. She is a freshman at San Diego State University and is undecided. She has been dancing for 16 years and this is her first year on the team. She is looking forward to getting to know people on the team and dancing at games. Alexis is 18 years old and is from Fullerton, California. She is a freshman at San Diego State University and is majoring in dance. Alexis has been dancing for 13 years at The Dance Spot where she learned ballet, jazz, tap, and lyrical. She is looking forward to performing at the games and competing with her new team. Anna is 18 years old. She’s originally from Nebraska and moved to the central coast of California in 2009. She’s been dancing for a total of 15 years and her favorite styles of dance are hip-hop and contemporary. 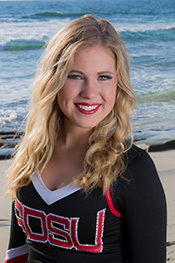 Anna is a freshman at SDSU and plans to major in kinesiology and eventually become a physical therapist. 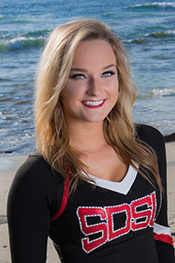 She is looking forward to her first year on the SDSU dance team and all the new experiences that are to come. Maddie is 19 and from Napa, California. 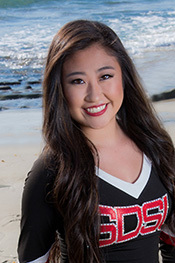 She is a sophomore at San Diego State University, and majoring in Child and Family Development and minoring in Dance. She has been dancing since she was three and competing since she was 12. Maddie can’t wait to cheer at football games and bond with all her new teammates throughout this upcoming year. Hannah Kehmna is 19 years old and grew up in San Jose, CA. She has been dancing since she was three years old. She has also been a competitive dancer for 8 years and her major is dance. She is looking forward to being more involved with her school while doing what she loves most. 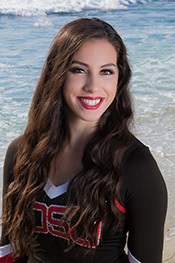 Jenna is a sophomore at San Diego State from Bentonville, Arkansas. Jenna is majoring in Mathematics with hopes in becoming the best high school Math teacher around. She has been dancing since she was 8 years old and loves some old fashion hip-hop moves. Her favorite moments on the team include the city-wide appearances and volunteer events she has had the opportunity to be apart of in San Diego! From competing in Orlando to performing in Qualcomm Stadium, she is a proud to call herself an Aztec! Nicole is 20 years old from Laguna Hills, California. Nicole is a sophomore at San Diego State University and is majoring in Psychology. 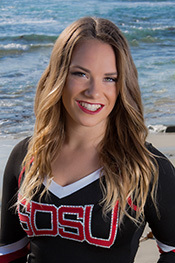 Her favorite styles of dance include jazz and contemporary and this is her second year on the SDSU Dance Team. Her favorite memories include dancing at football and basketball games as well as performing at various charity events throughout the year. She is looking forward to performing at more events and traveling to Florida for UDA Nationals. After college, Nicole plans to work with a non-profit organization as well as continue to pursue a career in dance. Haley is 18 years old and grew up in San Diego, California. She is a sophomore studying mechanical engineering at San Diego State University. 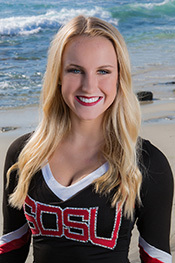 Haley has been dancing since the age of 4 and this is her first year on the SDSU dance team. She is looking forward to participating in school events like basketball and football games. Megan is 19 years old from Newbury Park, California. She is a junior at SDSU and is majoring in Kinesiology with an emphasis in pre-physical therapy. She has been dancing for 17 years, and her favorite style is contemporary. 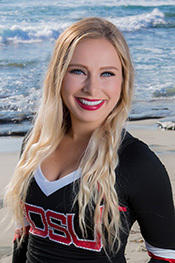 This will be Megan’s third year on the SDSU Dance Team and she is excited for another busy and successful year with her teammates. 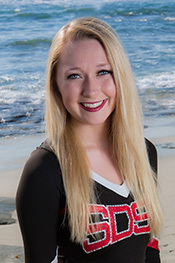 Megan’s favorite memories include cheering on our Aztec athletic teams and competing at UDA Nationals in Florida! After she graduates, Megan hopes to pursue a career in the medical field and travel the world. Nicole is 20 years old from Canyon Lake, California and is a junior at San Diego State University. She has been dancing for 12 years and her favorite styles of dance include contemporary, hip-hop, and jazz. This is Nicole’s third year on the team and her favorite memory so far is being featured on ESPN. She is majoring in kinesiology and after college plans to pursue a career in physical therapy and dance. Brittany is 19 years old from Chico, California. Brittany is a junior at San Diego State University and is majoring in psychology. 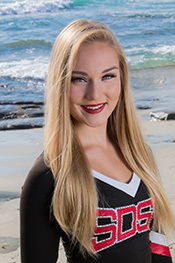 She has been dancing for 16 years and this is her third year on the SDSU Dance Team. Her favorite style of dance is hip-hop. Her best memories include the Kansas vs. SDSU game this past December and traveling to Las Vegas to support the women’s basketball team in the Mountain West Conference. 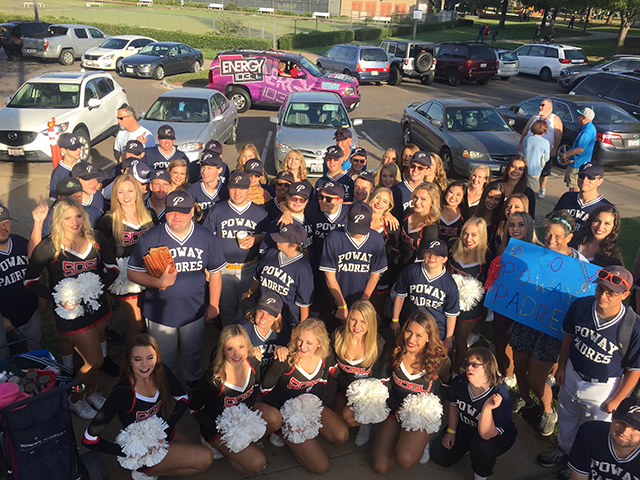 She is looking forward to football season and all of the community service events throughout the coming year. After graduation, she hopes to continue dancing and pursue a career involving criminal psychology. Taylor is 20 years old from Carlsbad, California. She is a junior this year at San Diego state and is majoring in dance. This is her third year on the team and has been dancing since she was 3 years old. Her favorite styles include Hip Hop, Contemporary, and Jazz. 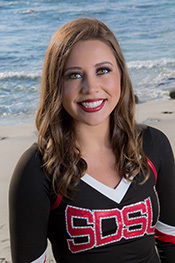 Taylor’s favorite part of the SDSU Dance Team is competing and performing at the basketball games. In the future she hopes to become a professional NBA or NFL cheerleader. Alexandria is 20 years old from Corona, California. She is very excited to be starting her third year at San Diego State University and is majoring in dance and in speech language and hearing sciences. Her favorite styles of dance are jazz and contemporary. 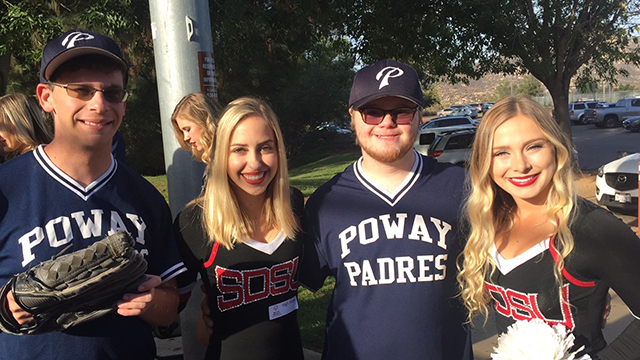 Her favorite memories of being on the SDSU Dance Team so far are performing at the football and basketball games, participating in Special Olympics, and winning first at USA Nationals. Alex hopes to continue dancing and sharing her love for dance along with becoming a speech therapist. Samantha is 20 years old from Murrieta, California. She is a junior a. San Diego State University and is majoring in Liberal Studies Elementary Education. 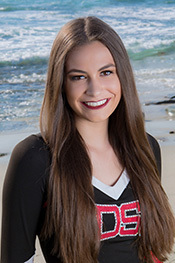 This is her third year on the SDSU dance team and her favorite thing about the team is competing at UDA and USA nationals. She has been dancing since the age of 3 and competing since she was 4. After college, she plans on pursuing a career as an elementary school teacher. Kathleen is 20 years old from San Jose, California. Kathleen is a junior at San Diego State University, majoring in hospitality. 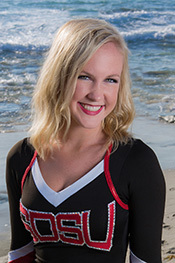 She has been dancing for 11 years and this is her third year on the SDSU Dance Team. Her favorite styles of dance are hip-hop, jazz, and contemporary. Some of her best memories on the team include traveling to Las Vegas for the Mountain West Tournament, placing 4th in the nation at UDA Nationals, and placing 1st at USA Nationals. In the future Kathleen plans on pursuing a career as an event organizer while still staying involved in the entertainment business. Danielle is 20 years old from Corona, California. Danielle is a junior at San Diego State University and is majoring in kinesiology with an emphasis in pre-physical therapy. 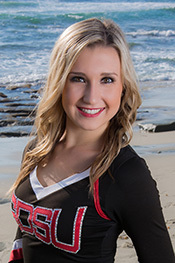 She has been dancing for 10 years and this is her first year on the SDSU Dance Team. She is looking forward to performing at all of the games and events the dance team attends, as wells as making lifelong friendships. After college she hopes to pursue a career in the medical field. 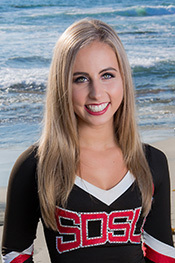 Samantha is a Senior at San Diego State University and this is her second year on the Dance Team. She attended Palomar College before transferring to SDSU last fall. She is studying health communication and hopes to work in the healthcare field sometime in her future. Samantha currently dances in the parades at Disneyland and hopes to continue her dancing career after she graduates. 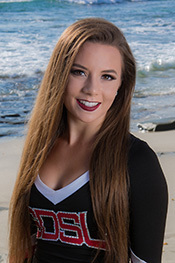 She is extremely excited to perform in front of the crowd at all the SDSU football and basketball games, and to represent San Diego State University at all the community events the dance team attends. 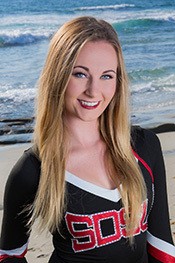 Becky is a Senior at San Diego State University and this is her second year on the Dance Team. She attended Mt. San Antonio College before transferring here last fall, and is from Diamond Bar, California. She has been dancing for 18 years and is getting her Bachelor’s degree in Psychology with hopes of becoming a rehabilitation psychologist, and working with special needs children. Her favorite styles of dance are jazz, contemporary, and hip-hop. Some of her favorite memories include competing at UDA and USA Nationals, placing 1st at USA Nationals last year, and forming lifelong friendships. She looks forward to another great year with her team! Kelsey is 21 years old from Rocklin, California. Kelsey is a senior at San Diego State University studying Communication and Marketing and this is her fourth year as a member of the team. 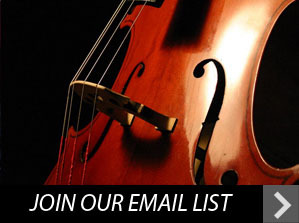 She has had 17 years of dance training and her favorite styles include jazz and contemporary. She enjoys performing and having the opportunity to represent SDSU at football games, basketball games, and other events in the community. Her favorite memories include placing fourth in the nation at UDA College Nationals and dancing at the Sweet Sixteen basketball game in Anaheim. After college, Kelsey plans on pursuing a career in the media industry and continuing her involvement with dance. Katie is 20 years old from Oceanside, California. She is a senior at San Diego State University and is majoring in Interdisciplinary Studies with focuses in communication, sociology and kinesiology. She has had 18 years of dance training and this is her fourth year on the SDSU Dance Team. Some of her favorite memories on the team so far include winning 4th and 7th place at UDA Nationals, 1st place at USA Nationals back-to-back, and traveling to the Sweet 16 Basketball Tournament. After college, Katie plans to teach dance to young children and begin her involvement in non-profit organizations. Jessica is 21 years old from Oceanside, California. Jessica is a Senior and is majoring in Interdisciplinary Studies with emphasis in Kinesiology, Writing and Communication. 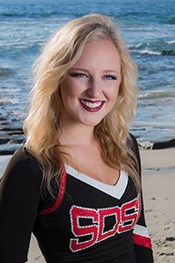 She has been dancing for 18 years and this is her fourth year on the SDSU Dance Team. Her favorite styles of dance are jazz and hip-hop. Her best memories include sitting courtside in North Carolina for the Duke vs. SDSU game and receiving fourth in jazz at UDA Nationals. She is looking forward to performing at all the events and competing with her team for one last time in Florida. After college, she plans on pursuing a professional career in dance. 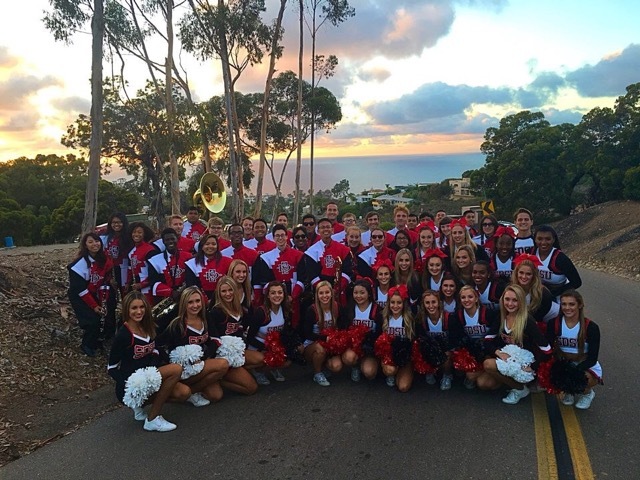 In beautiful La Jolla with members of the Marching Aztecs!